It took some time, but the Penguins were able to secure a victory in game one against the Tampa Bay Lightning behind stellar goaltending, and getting just enough offense. The team followed what was basically their script for the second half of the season. Play shut-down defense and get a little offense at just the right time. Marc-Andre Fleury was locked-in early on. He made a ton of big saves including beauties against Ryan Malone and Vincent Lecavalier that stopped what appeared to be game-changing goals. The Penguins offense started getting their chances in the second. Despite a multitude of opportunities, the Pens just couldn’t get past Lightning goalie Dwayne Roloson. In the third period however, those chances on offense, would eventually pay off. At the 6:05 mark of the final period, James Neal sent a slap pass to a wide open Alexi Kovalev who had somehow gone unnoticed behind the entire Lightning defense right in front of the net. He buried the shot, and the Penguins went up 1-0. Just 18 seconds later, Arron Asham converted a wrap-around goal that sent the Consol Energy Center into a frenzy, and locked the game up for the Penguins. 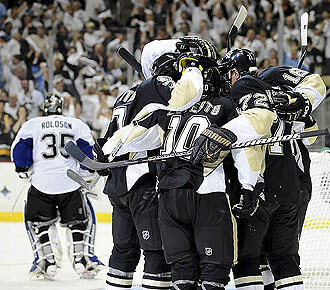 Chris Kunitz added an empty netter that completed the 3-o victory. The player of the game, no doubt, was Marc Andre Fleury. His 32 saves were the reason the Penguins were in the game. He’s peaking at the right time. There are few more depressing places while the Penguins are making their yearly run at the Stanley Cup than PNC Park. Last night in front of literally hundreds, the Pirates saw their first dip below .500 in 2011 after losing 6-0 to the Brewers. Despite throwing five no-hit innings, starter Kevin Correia came unraveled in the sixth, giving up four runs which were highlighted by a Prince Fielder three-run home run. My magical trip home to enjoy Pirate baseball came to an end. As I returned to school in Athens, Ohio, another sport near and dear to the sports fans of the Steel City is ramping up for the playoffs. The Penguins’ mad dash at the last second to steal the Atlantic Division away from the Philadelphia Flyers came up short, so they ultimately had to settle for the number four seed in the Eastern Conference. They will play the young and very talented Tampa Bay Lightning. Here are some things to keep in mind. Since the loss of Crosby and Malkin, the Penguins have been able to maintain their position in the standings with good defense. They will face a tough test from the potent Lightning offense that features two of the top 5 scorers in the NHL in Martin St. Louis and Steven Stamkos. The Penguins will have to keep up the intensity in their own zone, something they are more than capable of doing. I know a lot of people give me crap for doubting him but hear me out. The Penguins will need to score goals. Neal had 21 goals and 18 assists when he was acquired at the deadline as a means of replacing the scoring that was going to be lost from the Penguins’ fallen stars. He has scored just one goal and tallied five assists in black and gold. Don’t get me wrong, he’s done a lot to get the team here, but he’s going to have to start scoring sooner or later. The playoffs have brought out the best and worst in the Penguins’ number one netminder, but he’s been locked in most of this season, and his shaky beginning to the year is far, far behind him. If the Penguins make a deep run, he will be the key reason. If think otherwise, look at many of the teams that do. They all had hot goalies. They certainly haven’t won many pretty games since the injury bug has bit, but it seems that they always get just enough to pull out the victories. They are playing very well as a team, and that is very important come playoff time. The Penguins have developed a nasty habit of playing down to their competition at times throughout the season. The Lightning is a team with a deadly power-play that will strike if the Penguins find themselves in the penalty box too much. This series isn’t going to be a cake walk, however, the experience and defense are in the Penguins favor, two factors that usually lead to success in the playoffs.